Indications: Blocks histamine-2 to reduce the amount of acid produced by the stomach. Summary Recommendations: Zantac 75 is commonly prescribed or suggested for the treatment or prevention of stomach ulcers, intestinal ulcers, gastroesophageal reflux disease (GERD) and conditions that cause the stomach to overproduce acid. General Precautions: Zantac 75 should be used only as prescribed. Your doctor may prescribe the medication as part of a complete treatment program, including altered diet and other medications. It is important to follow all steps of the treatment program to relieve symptoms. Zantac 75 may take two months or longer to heal ulcers. Continue taking the medication even if you feel better or symptoms disappear. The active ingredient in Zantac 75 may increase your risk of developing pneumonia. Patients with liver disease, kidney disease or prophyria should discuss the safety of taking Zantac 75 with the doctor before starting treatment. Zantac 75 is available in pills, effervescent tablets and granules. The tablets and granules must be dissolved in water. These forms of Zantac 75 contain phenylalanine, which is contraindication in patients with phenylketonuria. Common side effects associated with Zantac 75 include headache, dizziness, insomnia, decreased libido and changes in bowel habits (constipation or diarrhea). More severe side effects have been reported, including fever, shortness of breath, chest pain, increased or decreased heart rate and nausea. Report all side effects to your physician. Effects While Trying to Conceive: In animal studies using up to 160 times the amount typically prescribed to humans, there was no effect on fertility, reproduction or mating habits. There have been no adequate studies completed on humans. 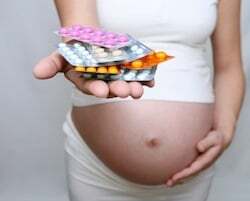 Effects on Pregnancy: Zantac 75 is in pregnancy category B. The drug does not appear to have any negative effects on pregnancy or fetal health; even at doses much higher than a pregnant woman would take to treat ulcers. No studies have been completed on humans. Not all animal studies are predictive of human outcome. Talk with your physician about the benefits and risks of taking Zantac 75 during pregnancy. Safe During Breastfeeding: Zantac 75 is excreted in breast milk. It is estimated about 300 mcg/kg of the medication is consumed by the breastfed infant when the mother is dosed at 150 mg per day. This amount is about 20% of the prescribed amount given to infants suffering from stress ulcer prophylaxis. There have been no reports of side effects in infants breastfeeding to mothers taking Zantac 75.